AMSTERDAM--(BUSINESS WIRE)--The most recent generation of flagship phones and smartwatches works with the revolutionary remote connectivity management solution enabled by Gemalto. “eSIM around the world” is becoming a reality that will enable millions of consumers to seamlessly provision and activate a mobile subscription and connect their favorite devices anytime, anywhere. With 3.5 billion devices on the market by 2025¹ cellular connectivity will play a major role in bringing massive IoT to life both on the consumer and M2M markets, exponentially increasing the number of mobile connections. 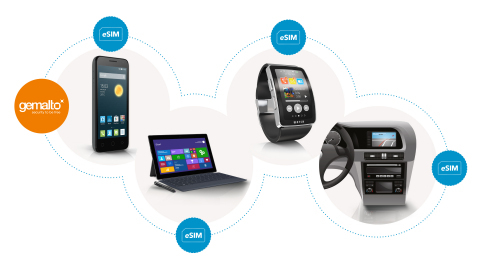 Gemalto has deployed more than 100 eSIM remote subscription management platforms to mobile operators, operator alliances, MVNOs, car manufacturers and OEMs across all continents. “We are thrilled to be writing this new chapter in our company history and for the IoT market ahead of us,” said Frédéric Vasnier, executive vice president, Mobile Services and IoT at Gemalto. “More than 900 million eSIM are expected to be shipped yearly by 2022² and we are committed to continued innovation in security and connectivity to enable the trusted connections of tomorrow."